Not a bad sporty 125 that does everything you could want a 125 to do with litte hassle. Cheap price means these are a very tempting choice over more expensive, but better Japanese machines like the Honda CBR125. 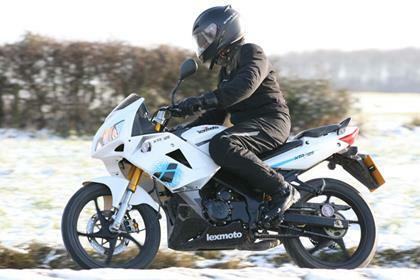 f you're not bothered about the name on the tank, the Lexmoto is a good choice. 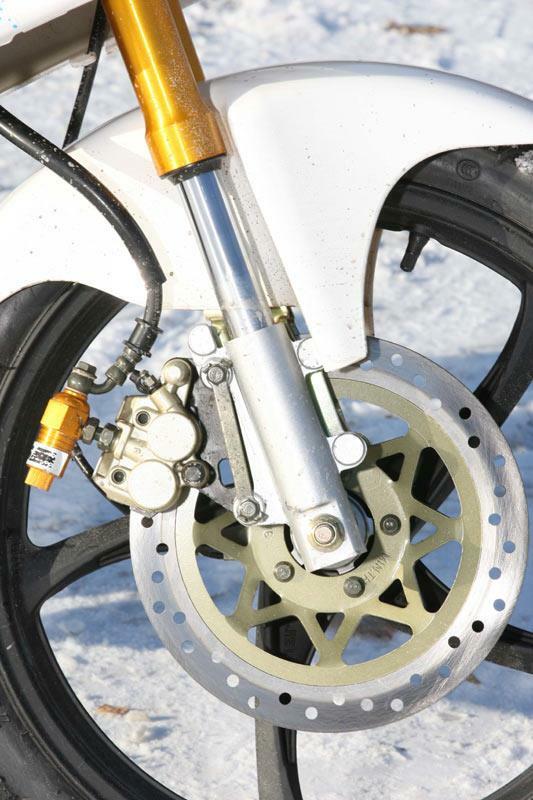 The XTR125 goes round corners perfectly fine, with bumps upsetting the bike due to its lightweight and budget suspension. Of course it's nothing like an Aprilia RS4 or Yamaha YZF-R125, but what did you expect? The engine's nothing special, and it's certainly not a pleasant sounding thing, but it is a 125cc four-stroke that'll get you moving up to legal speeds in comfort and safety. 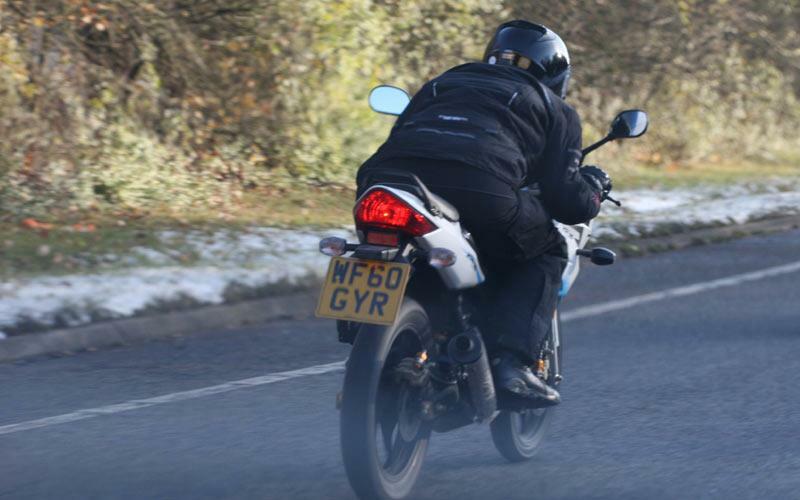 On our test bike we were unable to get the bike in to neutral with the engine running. Our test machine had a mysterious nut rattling around under the seat, a missing end-plate off the chain adjuster and a couple of peeling stickers. 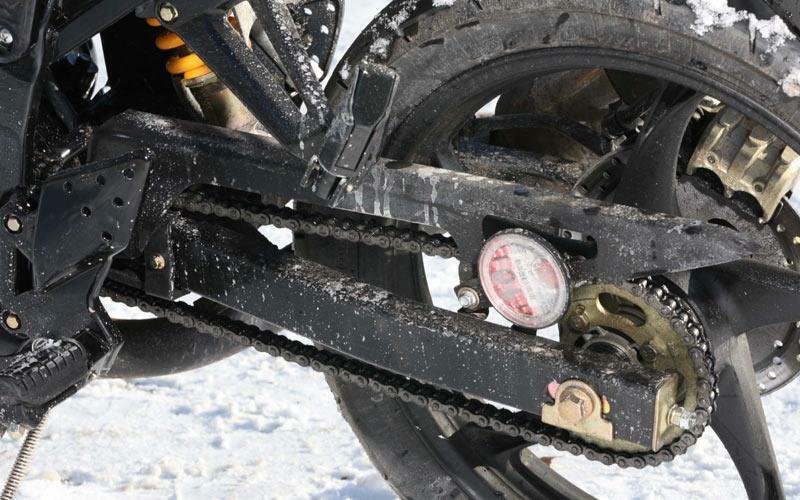 These should all be sorted at the factory, and aren't problems you'd expect on new bikes. 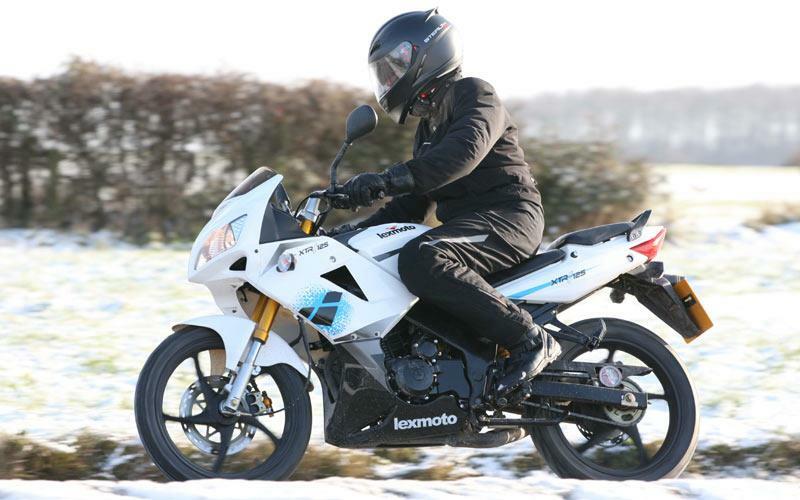 If it does go wrong, Lexmoto have a very good parts back-up and UK importer. It's hard to argue with a price tag of just £1099.99, although Lexmoto do have cheaper bikes available. Equipment is basic, as you'd expect. You get two wheels, a frame, engine, seat and everything needed to get where you're going in relative comfort and safety. The test bike supplied had an ABS sticker on the fork legs, but there's no ABS. 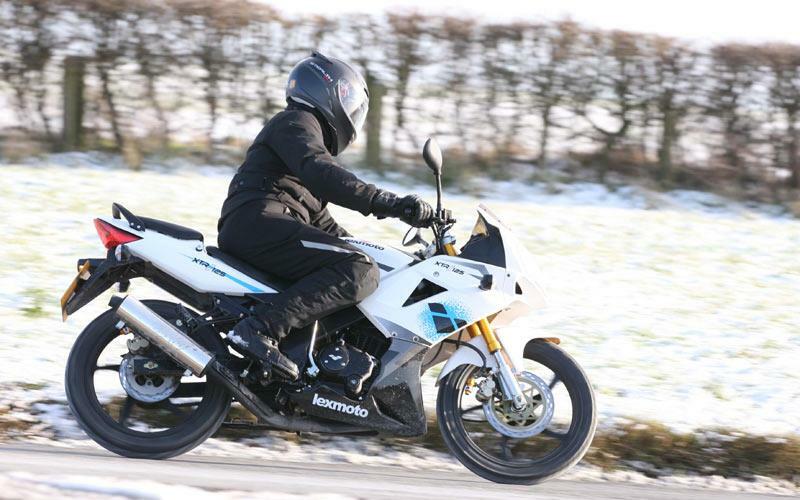 5 owners have reviewed their LEXMOTO XTR 125 (2012-on) and rated it in a number of areas. Read what they have to say and what they like and dislike about the bike below. 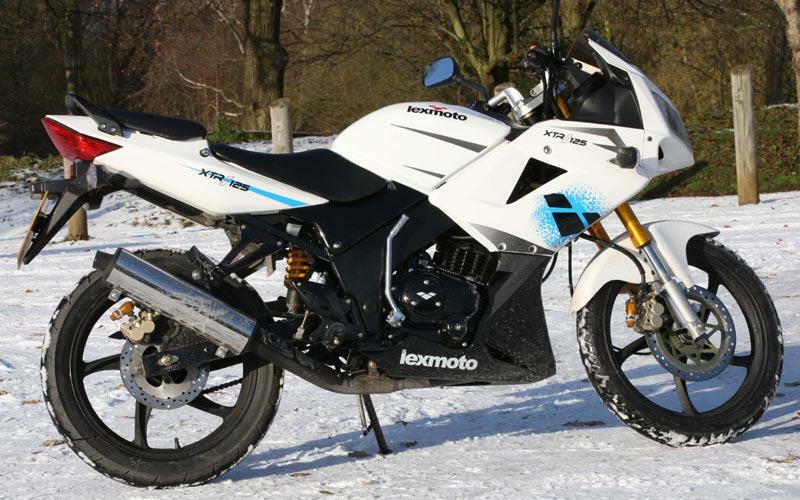 Lexmoto XTRS 125 - Good little starter bike. Bought this bike brand new in December 2016, ive had it just over a year and a half now and im up to 7000km. I haven't really had any issues at all with the bike except for the stock exhaust pipe rusting pretty quickly. My dealership gave me a 5 year warranty with the bike for parts and labor which remains in effect as long as i get all the major/required services done there. The bike did have a little trouble starting during the first 1000km but i will put that down to the running in period and low temperature. The only problem ive had since then is that the voltage regulator died, so it stopped charging the battery, told my dealer, took it up there and it was replaced free of charge. Top speed it about 70mph with the standard 15 tooth sprocket, will sit happily at 55-60, the fuel economy is amazing £5 to fill the tank and it seems to last forever! One thing to note is the tyres, they are fine in the dry but can pretty bad in the wet depending on the road surface make sure to leave enough distance to brake and don't go too fast! I would recommend this bike to anyone that is new to motorcyles or just want an easy commuter. I have learned a lot about the inner workings and general maintenance of motorbikes after owning this one. Not sure why the reviews are so negative on here about this bike, maybe a bad dealer or previous/current owners killed it or diddnt maintain it? Vibration inst bad, at over 7000rpm you can feel it in the handlebars but it isnt that bad, no worse than a Japanese bike. Decent suspension, a nice little bike to ride. Not that leant forward seating position for a sports style bike which is good in my opinion. Brakes are good and responsive, be sure to keep them clean if you ride in wet/dusty conditions alot or they will begin to rub, this goes for any bike though, maintenance is key. Its a 4 stroke 125 single cylinder air cooled engine, it is what it is. Pretty bulletproof, as with any 4 stroke 125 after a while you will crave more power, but within its limits it fine, ive had 75mph out of it downhill, normally on a flat surface your looking about 65 - 70 flat out. It does feel pretty fast though because its only a small bike! I attempted to get a little more power by up-jetting the carb to a 105/110 main jet and getting a free flow air filter, in the end i put the stock 95 jet and filter back on because the small amount acceleration i gained made me lose the economy factor, it started to eat through fuel much faster. Build quality itself is great, no loose bolts or anything, clean and tidy. Never failed to start for me, as stated before during the running in/winter period it diddnt start first time, then ofcourse when the battery was dead! Apart from that it has been very reliable for me. Corrosion wise the stock exhaust downpipe and muffler did start to rust pretty quickly, the axle plates lost their gold finish pretty quickly too. Small amount of rust on the swingarm near the chain adjusters, just scrubbed it off and sprayed it, been fine since then. Voltage regulator died last month but had it replaced free of charge under warranty. Very economical on fuel, first few services are pretty close together but are much cheaper than the annual service, worth it in the long run to keep the 5 year warranty. Plenty of spare parts online at either CMPO, VMP or Ebay. I would recommend getting the stainless steel exhaust system as soon as possible as my stock one did tend to rust quite quickly, it sounds beasty too! I havent changed the tyres from new but as mentioned before they are not the best in the wet. 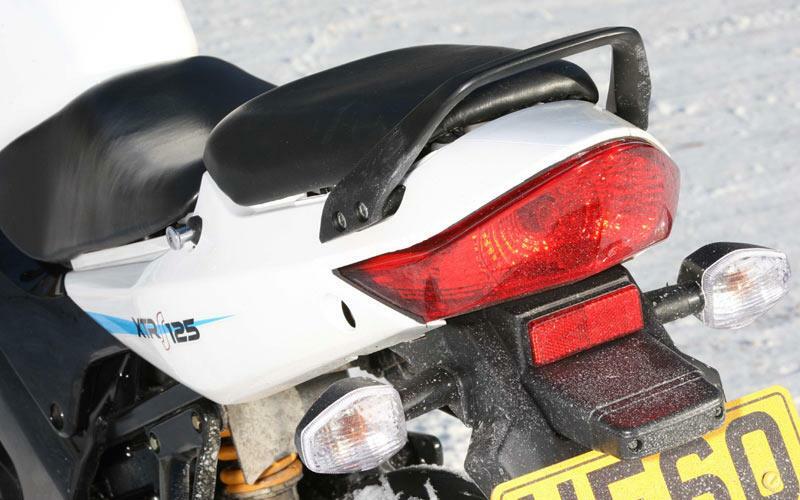 My favorite feature of the bike is the look of it i have it in Black and it looks nice, and BOTH the headlights light up on both full and low beam which is nice! Bought brand new from Speedway Motorcycles in Cannock UK for £1300 OTR. Cant fault the dealership, happy to answer any questions or queries ive had, not had any problems with the warranty. I will not write good things about this bike, bought one second hand, had approx 500km on the clock then since i commute i put on approx 8000km and within that time period broke down several times, throttle cable snapped twice within 2 month, front brake catches a lot. i used it as a commute and got to my destination and back which is about 130m and it starts off as it seems its struggling, the back brake faltered got that fixed, then about a month later the front brake gave in. very badly built, can feel every bump, screws coming loose, the plastic cover shakes that much the screws easily come out, corrosion by the exhaust, the chain comes loose, the front brake catches even after having it fixed after about 100km it started catching again. was due its service but then i decided to cut my losses and go buy a second hand Honda. £550 in December 2016, come by March 2017 spent over £300 on repairs. the MPG is the only good thing about this bike. Privately, was wanting £700, got it for £550. no customer service, from an uncaring brand - attitude shocking cheap and unreliable been 3 months trying to get the bike sorted out by local dealer - bike still not running - went direct to Lexmoto, who had not interest the situation and fobbed us off. Imagine if a brand like Yamaha, Kawasaki or Triumph had this sort of attitude towards their paying customers! Paid £1200 dealer lovely towards us when handing over the cash for purchase Attitude changed when there was a problem. Then it was about screwing money out of us. Claimed repair done and bike starting first time everytime. When we went to collect took them 30 mins to start it. They were more than happy to see the back of us and let us leave on a bike they know they hadn't fixed. Shoddy workmanship, nasty attitude when complaint made. The bike isn't the greatest bike you can find on the market. An Re-branded CBR it isn't. What you cannot argue with is the price. You get a great product for the money. You will need to look after it a bit but still awesome value for money. Considering most people only keep a 125cc for a year you cannot go wrong and let's be honest the depreciation on a Jap bike would probably be as much as this is outright. Your money is better sent here as at least you have dealer backup with a new bike. This bike is a false economy. If you want a Jap bike, but can't afford it right now, just save your money, or you'll pay in the end. I had to replace the engine mounts twice, the throttle cable twice, constant electrical faults, and eventually the bike started breaking down every time it rained. Bolts and screws always come loose and I was buying new parts every week. Yes the parts availability is good on ebay and llexeter, but it has to be as they break so bloody often. If I could go back in time I would have got a second hand honda cbr125, at least I could have sold it on for more than £100 like what I got for the Lexmoto. Poor build quality, starts to rust quickly(especially the swing arm). I hope this saves someone the aggravation that I had with this pile of dog crap! !